In large bowl, mix 1 1/2 cups of the flour, the sugar and yeast. Add warm water. Beat with whisk or electric mixer on low speed 1 minute, scraping bowl frequently. Cover tightly with plastic wrap; let stand about 1 hour or until bubbly. Stir in oil, rosemary and salt. Stir in enough remaining flour, 1/2 cup at a time, until a soft, smooth dough forms. Let stand 15 minutes. Place dough on lightly floured surface. Knead 5 to 10 minutes or until dough is smooth and springy. 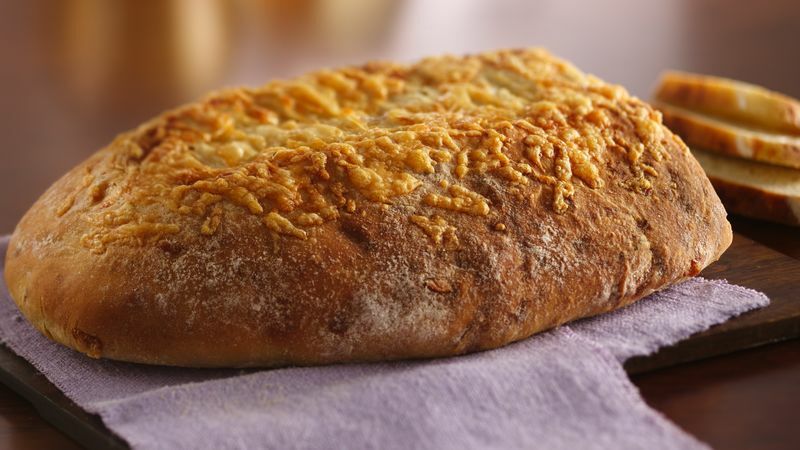 Knead in 1 cup of the cheese. Grease large bowl with shortening. Place dough in bowl, turning dough to grease all sides. Cover bowl tightly with plastic wrap and let rise in warm place 45 to 60 minutes or until dough has doubled in size. Dough is ready if indentation remains when touched. Lightly grease uninsulated cookie sheet with shortening or cooking spray. Place dough on lightly floured surface. Gently shape into football-shaped loaf, about 12 inches long, by stretching sides of dough downward to make a smooth top. Place loaf with smooth side up on cookie sheet. Coat loaf generously with flour. Cover loosely with plastic wrap; let rise in warm place 45 to 60 minutes or until dough has almost doubled in size. Place 8- or 9-inch square pan on bottom rack of oven; add hot water to pan until about 1/2 inch from the top. Heat oven to 450°F. Spray loaf with cool water; sprinkle with flour. Using serrated knife, carefully cut 1/2-inch-deep slash lengthwise down center of loaf. Sprinkle remaining 1/4 cup cheese into slash. Bake 10 minutes. Reduce oven temperature to 400°F. Bake 20 to 25 minutes longer or until loaf is deep golden and sounds hollow when tapped. Remove from cookie sheet to cooling rack; cool.